I began to write this from a hotel in Mankato, we were there to watch my daughter play in a basketball tournament in New Ulm. It was a fun time. However I couldn’t forget that 146 years ago this quaint village was the sight of the largest mass execution in U.S. history, and roads we drove followed trails along the Minnesota River Valley that had once been filled with fear, anger, and grief. If we go back 150 years, Minnesota was being birthed out of the prairie. The name “Minnesota” honors the native residents of this land, the Dakota. In their language it refers to the land of waters. However this is the extent to which the Dakota and Lakota people were honored. As Minnesota was formed, white settlers streamed in, and the Dakota chiefs agreed in 1851 to relocate on a reservation, seeing it as their only hope for survival. That reservation, which extended from west of New Ulm, north and west along the river to the present South Dakota boarder, no longer exists today. It was during this time a Dakota warrior and an Episcopal priest first encountered one another. They forged a cross cultural friendship that can, in many ways, serve as role model to us today. These two men sought to live in reconciled relationships across race and cultural divides, they were not perfect, but their story teaches us something about the rewards and costs that can come by truly living in solidarity. 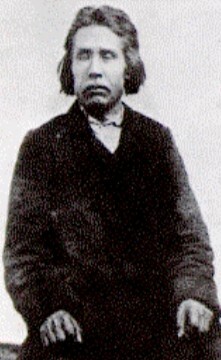 Taopi was born in 1820 near present day St. Paul, he was part of the Little Crow Band of Mdewakanton Dakota. In 1851 they were forced to move to the reservation along the Minnesota River. Taopi became the leader of his Little Crow band. He believed that their only way of survival was to try to get along with the white settlers and make peace with the great father in Washington. He hoped that by embracing, farming, white man clothing, and Christianity he and his people could find peace and a place along side the Immigrants who had taken over their land. 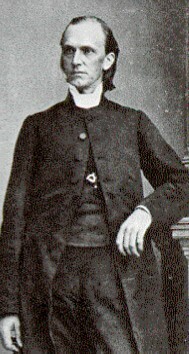 Bishop Henry Whipple, who came to Minnesota in 1859, was born in 1822 in up-state New York. “After ordination Whipple served parishes in Rome, New York and Chicago, where he gained a reputation for his service to poor immigrant groups. His Chicago ministry drew him to the attention of the newly formed Episcopal Diocese of Minnesota which elected him its first bishop in 1859. He served until his death in 1901. The war began after the Dakota had suffered starvation and insults. Delayed payments from the US government were compounded by corrupt traders taking most of the money and Federal Indian Agents insulting the Dakota people. For a detailed account follow this link. or this. Taopi and Whipple shared mutual respect for each other. This relationship and their commitment to the gospel of Jesus, caused them to take stands of advocacy, as well as personal and professional risks that made them unpopular among their “own” people. After the war, Minnesotans wanted to execute as many Dakota as possible, but Bishop Whipple advocated that “since the U.S. had violated the terms of a treaty, the Dakota had the right to go to war.” He argued that only those guilty of crimes against citizens (not fighting as soldiers) should be executed. President Lincoln personally reviewed the list of condemned and spared 265 Dakota from hanging. Bishop Whipple was scorned by press and politicians, because of his honest critic of the states and nations dealings with the Dakota people. Here is a link to some articles he wrote discussing the causes and results of the war. After the war the white settlers called for all the Dakota removed from southern Minnesota. 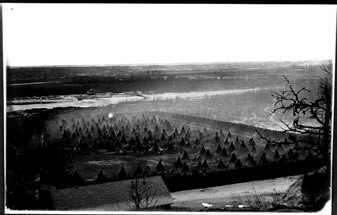 Many were forced marched to Dakota territory and over 1600 (many women and Children) were held for a winter in an internment camp on Pike Island below Fort Snelling. In the spring they were forced on to barges and taken by boat to the Dakotas (Crow Creek) and Nebraska. Many died during the winter and the river passage. Many retold the story that along the forced marches “… women [were] picking over the dung of their horses to find half-digested kernels of grain to save their children from death.” Hundreds died in this Minnesota trail of tears. All Dakota were initially banned from the state and a bounty was offered to any settlers who could bring in a “native scalp”. During this time Bishop Whipple continued to risk the wrath of other white settlers by insisting that Taopi and others who had not participated in the war should be allowed to stay in Minnesota. For the most part his calls for justice and charity fell on deaf ears, however Taopi and a few other Dakota were permitted to live in Fairbault, basically under Whipple\’s protection. As well as the a few Mdewakanton (Mendota and Shakopee) and who remained neutral or assisted white settlers in the conflict. However their lives were filled with struggle and prejudice from their white neighbors. I believe ( and have seen first hand) that even today true solidarity and reconciliation across race and culture will demand personal sacrifice, it will also change your point of view, and possibly make you unpopular among peers. But, I also believe it is God’s desire that we follow his Son’s example (the incarnation) in laying aside what may keep us from others for the sake of living out his Kingdom of love and justice. Lets learn from this piece of history, how to live out HisStory! What do these men teach us today?